When the oxygen supply runs short in heavy or prolonged exercise, muscles obtain most of their energy from an anaerobic (without oxygen) process called glycolysis. Yeast cells obtain energy under anaerobic conditions using a very similar process called alcoholic fermentation. Glycolysis is the chemical breakdown of glucose to lactic acid. This process makes energy available for cell activity in the form of a high-energy phosphate compound known as adenosine triphosphate (ATP). 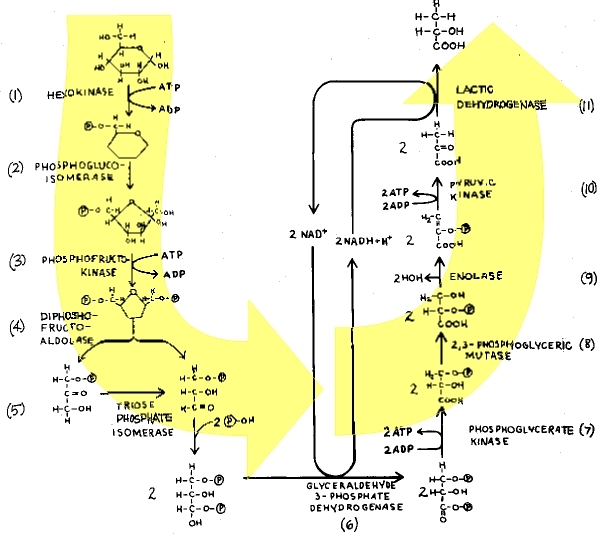 Alcoholic fermentation is identical to glycolysis except for the final step (Fig. 1). In alcoholic fermentation, pyruvic acid is broken down into ethanol and carbon dioxide. Lactic acid from glycolysis produces a feeling of tiredness; the products of alcoholic fermentation have been used in baking and brewing for centuries. Both alcoholic fermentation and glycolysis are anaerobic fermentation processes that begin with the sugar glucose. Glycolysis requires 11 enzymes which degrade glucose to lactic acid (Fig. 2). Alcoholic fermentation follows the same enzymatic pathway for the first 10 steps. The last enzyme of glycolysis, lactate dehydrogenase, is replaced by two enzymes in alcoholic fermentation. These two enzymes, pyruvate decarboxylase and alcoholic dehydrogenase, convert pyruvic acid into carbon dioxide and ethanol in alcoholic fermentation. The most commonly accepted evolutionary scenario states that organisms first arose in an atmosphere lacking oxygen.1,2 Anaerobic fermentation is supposed to have evolved first and is considered the most ancient pathway for obtaining energy. There are several scientific difficulties, however, with considering fermentations as primitive energy harvesting mechanisms produced by time and chance. First of all, it takes ATP energy to start the process that will only later generate a net gain in ATP. Two ATPs are put into the glycolytic pathway for priming the reactions, the expenditure of energy by conversion of ATP to ADP being required in the first and third steps of the pathway (Fig. 2). A total of four ATPs are obtained only later in the sequence, making a net gain of two ATPs for each molecule of glucose degraded. The net gain of two ATPs is not realized until the tenth enzyme in the series catalyzes phosphoenolpyruvate to ATP and pyruvic acid (pyruvate). This means that neither glycolysis nor alcoholic fermentation realizes any gain in energy (ATP) until the tenth enzymatic breakdown. Fig. 1. A comparison of two anaerobic energy-harvesting mechanisms. It is purely wishful thinking to suppose that a series of 10 simultaneous, beneficial, additive mutations could produce 10 complex enzymes to work on 10 highly specific substances and that these reactions would occur in sequence. Enzymes are proteins consisting of amino acids united in polypeptide chains. Their complexity may be illustrated by the enzyme glyceraldehyde phosphate dehydrogenase, which is the enzyme that catalyzes the oxidation of phosphoglyceraldehyde in glycolysis and alcoholic fermentation. Glyceraldehyde phosphate dehydrogenase consists of four identical chains, each having 330 amino acid residues. The number of different possible arrangements for the amino acid residues of this enzyme is astronomical. To illustrate, let us consider a simple protein containing only 100 aim acids. There are 20 different kinds of L-amino acids in proteins, and each can be used repeatedly in chains of 100. Therefore, they could be arranged in 20100 or 10130 different ways. Even if a hundred million billion of these (1017) combinations could function for a given purpose, there is only one chance in 10113 of getting one of these required amino acid sequences in a small protein consisting of 100 amino acids. By comparison, Sir Arthur Eddington has estimated there are no more than 1080 (or 3,145 x 1079) particles in the universe. If we assume that the universe is 30 billion years old (or 1018 seconds), and that each particle can react at the exaggerated rate of one trillion (1012) times per second, then the total number of events that can occur within the time and matter of our universe is 1080 x 1012 x 1018 = 10110. Even by most generous estimates, therefore, there is not enough time or matter in our universe to "guarantee" production of even one small protein with relative specificity. If probabilities involving two or more independent events are desired, they can be found by multiplying together the probability of each event. Consider the 10 enzymes of the glycolytic pathway. If each of these were a small protein having 100 amino acid residues with some flexibility and a probability of 1 in 10113 or 10-113, the probability for arranging the amino acids for the 10 enzymes would be: P = 10-1,130 or 1 in 101,130. And 1 in 101,130 is only the odds against producing the 10 glycoytic enzymes by chance. It is estimated that the human body contains 25,000 enzymes. If each of these were only a small enzyme consisting of 100 amino acids with a probability of 1 in 10-113, the probability of getting all 25,000 would be (10-113)25,000, which is 1 chance in 102,825,000. The actual probability for arranging the amino acids of the 25,000 enzymes will be much slimmer than our calculations indicate, because most enzymes are far more complex than our illustrative enzyme of 100 amino acids. Mathematicians usually consider 1 chance in 1050 as negligible.3 In other words, when the exponent is larger than 50, the chances are so slim for such an event ever occurring, that it is considered impossible. In our calculations, 10-110 was considered the total number of events that could occur within the time and matter of our universe. The chances for producing a simple enzyme-protein having 100 amino acid residues was I in 10113. The probability for 25,000 enzymes occurring by chance alone was 1 in 102,825,000. It is preposterous to think that even one simple enzyme-protein could occur by chance alone, much less the 10 in glycolysis or the 25,000 in the human body! Fig. 2. Notice that ATP is formed at two different locations above (steps 7 & 10). Because there are 2 molecules of the substrates, there will be 2 molecules of ATP formed at both locations, making a total of 4 molecules of ATP. Two molecules of ATP were necessary for priming the original breakdown of glucose (step 1). Therefore, a net of 2 molecules of ATP are recognized from the entire breakdown of glucose pyruvate. (4 ATP formed - 2 ATP primers = 2 ATP net overall gain.) Notice also that this MW net gain In ATP is not recognized until phosphoenolpyruvate is broken down by pyruvate kinase to form 2 molecules of pyruvate. This means that 10 enzymatic reactions must proceed in sequence, before energy in the form of ATP is obtained. There are still other problems with the theory of evolution for alcoholic fermentation and glycolytic pathways. It is necessary to account for the numerous complex regulatory mechanisms which control these chemical pathways. For example, phosphofructokinase is a regulatory enzyme which limits the rate of glycolysis. Glycogen phosphorylase is also a regulatory enzyme; it converts glycogen to glucose-1-phosphate and thus makes glycogen available for glycolytic breakdown. In complex organisms there are several hormones such as somatotropin, insulin, glucagon, glucocorticoids, adrenaline thyroxin and a host of others which control utilization of glucose. No evolutionary mechanism has ever been proposed to account for these control mechanisms. In addition to the regulators, complex cofactors are absolutely essential for glycolysis. One of the two key ATP energy harvesting steps in glycolysis requires a dehydrogenase enzyme acting in concert with the "hydrogen shuttle" redox reactant, nicotinamide adenine dinucleotide (NAD+). To keep the reaction sequence going, the reduced cofactor (NADH + H +) must be continuously regenerated by steps later in the sequence (Fig. 2), and that requires one enzyme in glycolysis (lactic dehydrogenase) and another (alcohol dehydrogenase) in alcoholic fermentation. In the absence of continuously cycled NAD+, "simple" anaerobic ATP energy harvest would be impossible. And there are further difficulties yet for evolutionary theory to surmount. At one point, an intermediate in the glycolytic pathway is "stuck" with a phosphate group (needed to make ATP) in the low energy third carbon position. A remarkable enzyme, a "mutase" (Step 8), shifts the phosphate group to the second carbon position—but only in the presence of pre-existent primer amounts of an extraordinary molecule, 2,3-diphosphoglyceric acid. Actually, the shift of the phosphate from the third to the second position using the "mutase" and these "primer" molecules accomplishes nothing notable directly, but it "sets up" the ATP energy-harvesting reaction which occurs two steps later! In summary, the following items make an evolutionary origin for glycolysis and alcoholic fermentation totally untenable: (1) the extreme improbability of getting even one simple enzyme by random processes; (2) the fact that the overall net gain in energy (ATP) is not recognized until pyruvate formation suggests that the chemical reaction must proceed through at least 10 enzymatic steps and that these steps of necessity must be in sequence; (3) the complex regulatory mechanisms, cofactors, and "primers" necessary for glucose utilization cannot be explained by evolutionary speculation. On the other hand, the tight fit among complex and interdependent steps—especially the way some reactions take on meaning only in terms of reactions that occur much later in the sequence—seems to point clearly to creation with a teleological purpose, by an Intelligence and Power far greater than man's. A.I. Oparin, Origin of Life, New York: Dover Pub., lnc., 1965, pp. 225-26. (Jark and Synge (eds. ), The Origin of Life on the Earth, New York: Pergamon Press, 1959, p. 52. Ernil Borel, Probabilities and Life, New York: Dover Pub., Inc., 1962, p. 28. * Dr. Morton holds a Ph.D. from George Washington University in Cellular Studies, has taught biology at American University and George Washington University, and has served as a consultant in microbiology. She is author of an outstanding book Science in the Bible (Moody, 1978) and has written numerous science instructional units for various grade levels. At the time of this article's writing, she was a member of I.C.R. 's Technical Advisory Board. Cite this article: Morton, J. S. 1980. Glycolysis and Alcoholic Fermentation. Acts & Facts. 9 (12).